A "blue moon" isn't really blue, as this artist rendering suggests. The moon can appear somewhat blue if there's been a major volcanic eruption that put tons of particles in the air, but otherwise blue moons refer to multiple full moons in certain time frames. The full moon of November arrives on Sunday and will bring with it a cosmic addition: It will also be a so-called "blue moon." Indeed, November's full moon is blue moon – but only if we follow a rule that's now somewhat obscure. In fact, the current "two- full moons in one month" rule has superseded an older rule that would allow us to call Sunday’s moon "blue." To be clear, the moon does not actually appear a blue color during a blue moon, it has to do with lunar mechanics. Lafleur cited the unusual term from a copy of the 1937 edition of the now-defunct Maine Farmers’ Almanac (NOT to be confused with The Farmers’ Almanac of Lewiston, Maine, which is still in business). On the almanac page for August 1937, the calendrical meaning for the term "blue moon" was given. That explanation said that the moon "… usually comes full twelve times in a year, three times for each season." "This was considered a very unfortunate circumstance, especially by the monks who had charge of the calendar of thirteen months for that year, and it upset the regular arrangement of church festivals. For this reason thirteen came to be considered an unlucky number." And with that extra full moon, it also meant that one of the four seasons would contain four full moons instead of the usual three. "There are seven Blue Moons in a Lunar Cycle of nineteen years," continued the almanac, ending on the comment that, "In olden times the almanac makers had much difficulty calculating the occurrence of the Blue Moon and this uncertainty gave rise to the expression 'Once in a Blue Moon.'" But while LaFleur quoted the almanac’s account, he made one very important omission: He never specified the date for this particular blue moon. As it turned out, in 1937, it occurred on Aug. 21. That was the third full moon in the summer of 1937, a summer season that would see a total of four full moons. Names were assigned to each moon in a season: For example, the first moon of summer was called the early summer moon, the second was the midsummer moon, and the last was called the late summer moon. But when a particular season has four moons, the third was apparently called a blue moon so that the fourth and final one can continue to be called the late moon. So where did we get the "two full moons in a month rule" that is so popular today? Once again, we must turn to the pages of Sky & Telescope. This time, on page 3 of the March 1946 issue, James Hugh Pruett wrote an article, "Once in a Blue Moon," in which he made a reference to the term "blue moon" and referenced LaFleur’s article from 1943. "Seven times in 19 years there were – and still are – 13 full moons in a year. This gives 11 months with one full moon each and one with two. 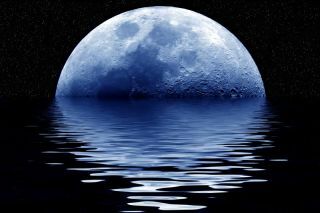 This second in a month, so I interpret it, was called Blue Moon." How unfortunate that Pruett did not have a copy of that 1937 almanac at hand, or else he would have almost certainly noticed that his "two full moons in a single month assumption" would have been totally wrong. For the blue moon date of Aug. 21 was most definitely not the second full moon that month! Pruett’s 1946 explanation was, of course, the wrong interpretation and it might have been completely forgotten were it not for Deborah Byrd who used it on her popular radio program, "StarDate" on Jan. 31, 1980. We could almost say that in the aftermath of her radio show, the incorrect blue moon rule "went viral" — or at least the '80s equivalent of it. Over the next decade, this new blue moon definition started appearing in diverse places, such as the World Almanac for Kids and the board game Trivial Pursuit. I must confess here, that even I was involved in helping to perpetuate the new version of the blue moon phenomenon. Nearly 30 years ago, in the Dec. 1, 1982 edition of The New York Times, I made reference to it in that newspaper’s "New York Day by Day" column. And by 1988, the new definition started receiving international press coverage. Today, Pruett’s misinterpreted "two full moons in a month rule" is recognized worldwide. Indeed, Sky & Telescope turned a literary lemon into lemonade, proclaiming later that – however unintentional – it changed pop culture and the English language in unexpected ways. Meanwhile, the original Maine Farmers’ Almanac rule had been all but forgotten. Now, let’s come back to this Sunday’s full moon. "But wait," you might say. "Dec. 21 is the first day of winter." And you would be correct, but only if you live north of the equator in the Northern Hemisphere. South of the equator it’s the first day of summer. In 2010, the solstice comes at 6:38 p.m. EST (2338 UT). But the moon turns full at 3:13 a.m. EST (0813 UT). That’s 15 hours and 25 minutes before the solstice occurs. So the Dec. 21 full moon occurs during the waning hours of fall and qualifies as the fourth full moon of the season. This means that under the original Maine Almanac rule – the one promoted by Lafleur and later misinterpreted by Pruett – the third full moon of the 2010 fall season on Nov. 21 would be a blue moon. So what Blue Moon definition tickles your fancy? Is it the second full moon in a calendar month, or (as is the case on Sunday) the third full moon in a season with four? Maybe it’s both. The final decision is solely up to you. Sunday’s full moon will look no different than any other full moon. But the moon can change color in certain conditions. After forest fires or volcanic eruptions, the moon can appear to take on a bluish or even lavender hue. Soot and ash particles, deposited high in the Earth's atmosphere, can sometimes make the moon appear bluish. In the aftermath of the massive eruption of Mount Pinatubo in the Philippines in June 1991, there were reports of blue moons (and even blue suns) worldwide. We could even call the next full moon (on Dec. 21) a "red moon," but for a different reason: On that day there will be a total eclipse of the moon and, for a short while, the moon will actually glow with a ruddy reddish hue. More on that special event in the days to come here at SPACE.com, so stay tuned!